My garden has been flowerless for months. A blanket of snow now covers the hillside, adding an elegant dimension to the trees and flower beds but I miss color. This is an excellent time to review some custom handmade quilts that are also quilt wall hangings. There is no quicker way to bring color and design into a room than to hang a handmade quilt. This handmade quilt wall hanging has color, whimsy and three dimensions through the machine quilting. The fabric colors certainly catch one’s eye with the purples and chartreuse. It’s not until one gets closer that one sees the details of the machine quilting, which adds another layer of flowers to the overall quilt design. The lollipop garden flowers are also interesting. They remind me of a modern take on the yo-yo’s that where once popular handmade quilts. The incorporation of the chartreuse fabrics is also interesting. A modern take on green, chartreuse used to be the exception to the rule. The popularity of chartreuse makes this Lime Green Double Wedding Ring Quilt a modern version of the traditional patchwork wedding quilt design. This quilt wall hanging was featured at the Piece and Plenty Quilt Guild Show in 2015 in Rolla, Mo. 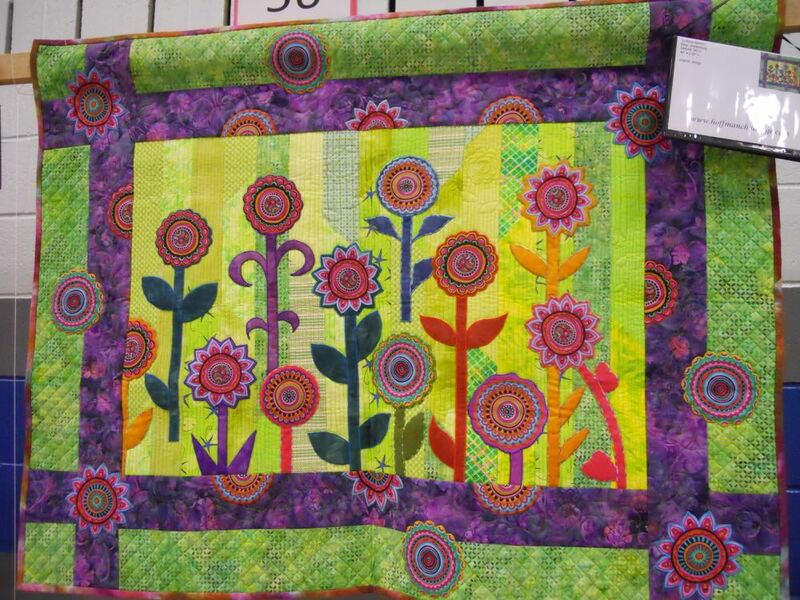 As many quilt shows do, this custom handmade garden quilt was entered in the Hoffman Challenge category, which recognized the best incorporation of fabrics into the quilt design. I’m just happy to see a bright spot of color amidst the cold Missouri winter!